After the break-up of CMU, James Gordon, Terry Mortimer, and I decided to keep working together. To reflect the grouping of three, we chose the name Trident. We brought in two musicians from the Cambridge area – Richard Joseph on bass guitar and vocals, and Nod Knowles on drums. We decided on a range of changes to the musical policy. First, bringing in Richard on bass allowed me to return to the guitar, so allowing me to shape more clearly the musical direction, as had happened in the Leeds concert. Second, an electronic organ was obtained for Terry, which allowed him to exploit both his interest in sonorities, but more important, to return to his preferred instrument, the piano/keyboard. The addition of Richard gave a strong, though all male vocal front line to the group. The programme for our last performance states that “Their aim is to bring back into rock some of the spirit of the groups that started the movement.” This was a reaction to the increasing lightness of touch which had been the essential quality of the CMU Open Spaces album. It also drew on those musical approaches which had given Terry and me our original partnership in R and B. The name Trident also reflected this much more positive, even aggressive quality in the music. Unfortunately there are no recordings of the instrumental music. In the final performance Gulf Stream, Three Part Work and Little Miss Julie make a re-appearance, as do Meet Me (to be heard on the CMU at the Tech recording) and Journey (an original by Terry). The aim was to develop an improvisational style which retained in spirit the jazz origins of Terry and myself, but which reflected the desire of both for a more wide ranging concept of improvised music. This can be seen from the titles of the new vehicles Polish Jig, Slow with Echo and two pieces for the duo just entitled Free Improvisation... The result was a much “heavier” approach which was contemporary but not clearly inspired by free jazz in the way that Electrical Phenomena (CMU at the Dog and Pheasant) had been. Vocals had a strong role in the performances – of particular note was James’ beautiful song In Memoriam HKG. But this CD is not a recording of that live event. It was created in a studio in response to the record company’s demands. 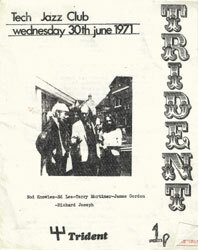 They had informed us that if there was to be any future for Trident, the current market now indicated a rise in popularity of singles, rather then LP records. The producers saw this as reflecting the new mood of the 70s, in reaction to the expansive and even self-indulgent music of the previous decade. It will be remembered that the original motivation for the whole CMU enterprise had been a deep love for jazz, and a desire to explore the various avenues into which the music was moving. However, by the time of Trident, it had become clear that James, Terry and Ed all saw their future as being in professional music. So the desire to create more intense but less commercially viable music had to be set against the need to survive and make a career in the field. In fact, James and I had already collaborated successfully to write catchy songs, such as Clown. So it is not perhaps surprising that we were able to create four pieces which contrast, which have a clear atmosphere and structure, which have punchy and witty lyrics, and above all are very memorable themes. These singles, though sophisticated, clearly meet Pop criteria. Unfortunately, this highly promising start did not lead further. In the summer of 1971, Terry decided that the loss of Roger Odell as a drummer, and the move away from jazz of both groups made the future less attractive. More important, he had an offer to take a Music degree at Goldsmiths’ College, University of London, which he felt he could not reject. The loss of such a key member meant that the group folded, and the enterprise which had begun with his arrival in Cambridge two years before was over. Terry went to London University, and then into the theatre, becoming at various points a Musical Director for the National Theatre. James left full-time music, and went into a career in which he engaged deeply with social issues, and most notably race relations. Roger Odell continued with CMU until its break up in 1972 and then worked with the very popular band Shakatak. Adrian Kendon became very well known for his work in jazz in the South of England, most notably in his development of the subject at Chichester College. Larraine Odell continued with CMU and after that went on to sing in jazz clubs, especially in East Anglia. Ian Hamlett, Richard Joseph and Nod Knowles moved out of music as a career. Ed and Terry have not worked together but have been frequent contact over the years, as Terry married Ed’s sister-in-law, theatre designer and costumier, Lizzie Wyllie. Basically the quality of these tracks is sound. However, the only copy of the tracks is a vinyl demo record, (which does not have the durability even of commercial vinyl). and despite great care, the signs of wear can be heard on some soft passages, notably Strange to Say. If anyone has a copy in better condition, I will be glad to replace these tracks. But I believe that their musical quality still makes it worth while to issue them. Click on the title to hear/download the MP3.